How can a potato be a battery? How quickly will a shark find you? What food should you take with you when climbing a mountain? The Really Useful Book of Secondary Science Experiments presents 101 exciting, ‘real-world’ science experiments that can be confidently carried out by any KS3 science teacher in a secondary school classroom. It offers a mix of classic experiments together with fresh ideas for investigations designed to engage students, help them see the relevance of science in their own lives and develop a passion for carrying out practical investigations. Covering biology, chemistry and physics topics, each investigation is structured as a problem-solving activity, asking engaging questions such as, ‘How can fingerprints help solve a crime?’, or ‘Can we build our own volcano?’ Background science knowledge is given for each experiment, together with learning objectives, a list of materials needed, safety and technical considerations, detailed method, ideas for data collection, advice on how to adapt the investigations for different groups of students, useful questions to ask the students and suggestions for homework. Additionally, there are ten ideas for science based projects that can be carried out over a longer period of time, utilising skills and knowledge that students will develop as they carrying out the different science investigations in the book. 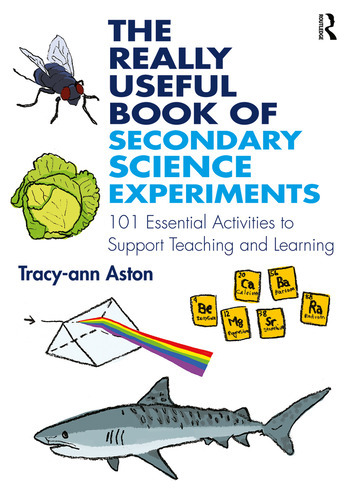 The Really Useful Book of Secondary Science Experiments will be an essential source of support and inspiration for all those teaching in the secondary school classroom, running science clubs and for parents looking to challenge and excite their children at home. Experiment 1: Observation: Are probiotic yogurts worth the extra money? Experiment 2: Observation: How similar are animal and plant DNA? Experiment 3: Observation: What do the inside of lungs look like? Experiment 4: Observation: Are all fats the same? Experiment 5: Observation: How do plants exchange gases? Experiment 6: Observation: How do apples decay? Experiment 7: Is salt a good preserver of food? Experiment 8: Fair testing: How can plants use wind to reproduce? Experiment 9: Fair testing: Are there enzymes in our liver? Experiment 10: Fair testing: What is the best food to take with you when climbing a mountain? Experiment 11: Fair testing: Which is the most dangerous see to swim in if you are bleeding? Experiment 12: Fair testing: How quickly will our muscles tire? Experiment 13: Fair testing: Can we speed up the rate of photosynthesis? Experiment 14: Pattern seeking: Where do daises grow? Experiment 15: Pattern seeking: Do taller people have larger hands? Experiment 16: Pattern seeking: Do insects prefer to live in the light or the dark? Experiment 17: Pattern seeking: Can long legs jump further? Experiment 18: Pattern seeking: Do our hearts beat faster when we work harder? Experiment 19: Pattern seeking: Are hand-dryers more hygienic than paper towels? Experiment 20: Classification and identification: Can you identify animal and plant cells just by looking at them? Experiment 21: Classification and identification: Can we classify leaves? Experiment 22: Classification and identification: What’s the best fruit and vegetable to eat when you have a cold? Experiment 23: Classification and identification: How can fingerprints solve a crime? Experiment 24: Classification and identification: Which plants are growing near our school? Experiment 25: Classification and identification: What’s in our food? Experiment 26: Modelling: Can we build a digestive system? Experiment 27: Modelling: Can we build a DNA separating chamber? Experiment 28: Modelling: Can we build a model of DNA? Experiment 29: Modelling: Can we ferment our own ginger beer? Experiment 29: Modelling: Can we build a bug hotel? Experiment 30: Modelling: Can we design and make a stethoscope? Experiment 31: Observation: Can a solid turn into a gas? Experiment 32: Observation: Where should we dig for oil?Experiment 33: Observation: What colour are M&Ms? Experiment 34: Observation: What is the best material for a campfire? Experiment 35: Observation: How can we make colourful flames? Experiment 36: Observation: What is special about the melting and freezing point of a substance? Experiment 37: Fair Testing: Which is the best washing powder? Experiment 38: Fair Testing: Can we prevent rusting? Experiment 39: Fair Testing: Which antacid is the most effective? Experiment 40: Fair Testing: Which is the best brand of disposable nappies? Experiment 41: Fair Testing: How does temperature affect the rate of a reaction? Experiment 42: Fair Testing: How quickly will a puddle evaporate on a hot day? Experiment 43: Pattern seeking: How quickly will a battery run down? Experiment 44: Pattern Seeking: What is the hardest liquid to swim through? Experiment 45: Pattern Seeking: Will aquatic plants grow in acidic water? Experiment 46: Pattern Seeking: Do all oxides have the same pH? Experiment 47: Pattern Seeking: Which element in group 2 of the periodic table is the most reactive? Experiment 48: Pattern Seeking: Which element in group 7 of the periodic table is the most reactive? Experiment 49: Classification and Identification: Are all changes reversible? Experiment 50: Classification and Identification: What is the best soil for growing plants? Experiment 51: Classification and Identification: How can we identify colourless gases? Experiment 52: Classification and Identification: How can polymers be identified? Experiment 53: Classification and Identification: Do chemical reactions always give off heat? Experiment 54: Classification and Identification: Does everything dissolve in water? Experiment 55: Modelling: Can we make our own fizzing bath bombs? Experiment 56: Modelling: Can we make popping fruit juice balls? Experiment 57: Modelling: Can we grow a crystal garden? Experiment 58: Modelling: Can we build our own volcano? Experiment 59: Modelling: How can cabbage be an indicator? Experiment 60: Modelling: Can we make a bouncing custard ball? Experiment 61: Observation: How many colours are there in light? Experiment 62: Observation: How does pressure vary in a water column? Experiment 63: Observation: What do waves look like? Experiment 64: Observation: Which objects will give you a static shock? Experiment 65: Observation: How do gases move? Experiment 66: Observation: How much ‘stuff’ do we make in a reaction? Experiment 67: Fair Testing: How can we change the brightness of a bulb? Experiment 68: Fair Testing: Why do moon craters vary in size? Experiment 69: Fair Testing: What are the most dangerous weather conditions to drive in? Experiment 70: Fair Testing: How can we increase the resistance in a circuit? Experiment 71: Fair Testing: How can blood spatter solve a crime? Experiment 72: Fair Testing: Can we stop radio waves? Experiment 73: Pattern seeking: How can you make a swing go faster? Experiment 74: Pattern Seeking: Can you break a spring? Experiment 75: Pattern Seeking: How can we make a magnet stronger? Experiment 76: Pattern Seeking: How does light enter and leave a mirror? Experiment 77: Pattern Seeking: How can we change the speed of light? Experiment 78: Pattern Seeking: What happens to waves in shallow water? Experiment 79: Classification and Identification: Which materials are best for keeping something warm? Experiment 80: Classification and Identification: Which materials are best for building an electric circuit? Experiment 81: Classification and Identification: Can we identity different types of radiation? Experiment 82: Classification and Identification: Can we classify all materials as solids, liquids or gases? Experiment 83: Classification and Identification: What is the densest liquid?Experiment 84: Classification and Identification: Where is the energy going? Experiment 85: Modelling: Can we cook food using the sun? Experiment 86: Modelling: Can we make our own camera? Experiment 87: Modelling: How can a potato be a battery? Experiment 88: Modelling: Can we build a catapult? Experiment 89: Modelling: Can we design and make a musical instrument? Experiment 90: Modelling: Can we make a crash helmet? Project 1: Healthy teeth Project 3: Environmental survey Project 4: Set Design Project 5: Olympic science Project 6: Chocolate lab Project 7: Scene of crime investigation Project 8: Fairground games Project 9: Aeroplane design Project 10: What’s the weather like?